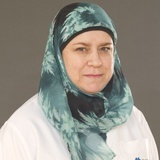 Dr. Dia Zein Eldin - Specialist Gynaecology & Obstetrics – NMC Medical Centre. Dr. Dia has obtained her MBBS from university of Aleppo-Syria and her Obestetrics & Gynaecology specialty from Ministry of Health -Aleppo – Syria highly experienced for long period in Aleppo Hospitals. From the past 3 years she has worked in the United Arab Emirates at Sharjah, Dubai & Umm Al Quwaim/Sheikh Khalifa general hospital. She has a special interest in high risk pregnancy and General Gynaecology. She has attended conference and update published articles in different magazine. She has also attended many Media interviews at different channels. She speaks Arabic and English fluently.